The day we met, I had flown deep into the central highlands, seeking a spot where I could be alone. I found it on a high desert plateau, where a hidden spring had forced its way up through the lava shield, forming an oasis. The water was a brilliant cobalt blue. It spread like fingers across the plateau, and all around it lay a bed of thick, luminous green moss. Tobin’s love of Iceland’s unusual landscape is clear. Though her prose is spare compared to some, she brings the land’s beauties to life in the reader’s mind. Tobin’s minimalist style continues throughout Ice Land, with mixed results. Sometimes the prose style works with the story, its simplicity emphasizing the raw forces of nature and the rugged lives of the people who live in the shadow of the volcano Hekla. Sometimes the writing works against the story, though, skimming over events that could be interesting to read, and describing settings (especially man-made settings) so thinly that I had trouble visualizing what these places looked like. What really bogged me down, though, was Ice Land‘s lack of forward momentum. There’s clearly a plot. The goddess Freya is trying to save Iceland from cataclysm by bargaining for the dwarves’ necklace Brisingamen, and the mortal girl Fulla is searching for love and a husband. Yet the tension never feels like it’s being ratcheted up. The characters wander from place to place, and in each place, have arguments. Their level of anxiety doesn’t seem to rise from one incident to the next. It just doesn’t feel like it’s going anywhere, even though I know that eventually it must. I’m also not sold on the central love story. The back cover promises “star-crossed lovers,” but I’m seeing bratty teenagers rather than epic soulmates. It takes amazing writing to make me like a story where characters fall in love after just a few brief meetings. It also takes amazing writing to make me like a couple who bickers all the time. Tobin adds the two together, and so getting me on board becomes nearly impossible. Fulla and her star-crossed love meet only a few times, fighting like cats and dogs on most of these occasions, before becoming obsessed enough to ruin lives over their forbidden desire. It doesn’t feel like true love to me. It feels like a selfish whim. I don’t like these two characters, and that’s representative of Ice Land as a whole. I just don’t like any of the characters much, and maybe that’s why I can’t get into the book. For a novel to hook me, it has to have great characters, a compelling plot, or (ideally) both. 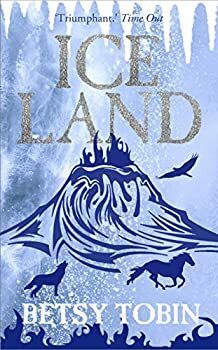 Ice Land has an interesting writing style and a beautiful setting, but fails to make me care about the characters or keep me turning pages. 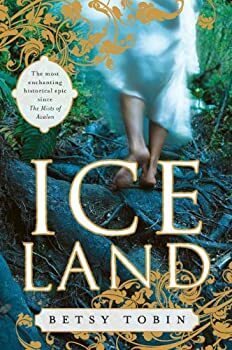 Ice Land — (2008) Publisher: A beautiful epic of love, longing, redemption, and enchantment in the tradition of Marion Zimmer Bradley’s The Mists of Avalon. Iceland, AD 1000: Freya knows that her people are doomed. Warned by the Fates of an impending disaster, she must embark on a journey to find a magnificent gold necklace, one said to possess the power to alter the course of history. But even as Freya travels deep into the mountains of Iceland, the country is on the brink of war. The new world order of Christianity is threatening the old ways of Iceland’s people, and tangled amidst it all are two star-crossed lovers who destiny draws them together — even as their families are determined to tear them apart. Infused with the rich history and mythology of Iceland, Betsy Tobin’s sweeping novel is an epic adventure of forbidden love, lust, jealousy, faith and magical wonder set under the shadow of a smoldering volcano.